"Welcome to Paradise," is a fitting expression for those visiting the coastal city of Santa Barbara. Called the American Riviera, Santa Barbara is a place where food, art, history, fashion, wine and sunshine mix to create a delightful and unique experience for the visitor. Charming Spanish and Moorish style buildings graced by brilliantly-colored bougainvillea, palm-lined beaches, a warm Mediterranean climate, charming sidewalk cafés and a pristine seaside setting are some of the aesthetic reasons for visiting Santa Barbara. The "Queen of the Missions," Santa Barbara's Old Mission can be traced back to the 1700's when the mission was built to bring Christianity to the Chumash Indians. 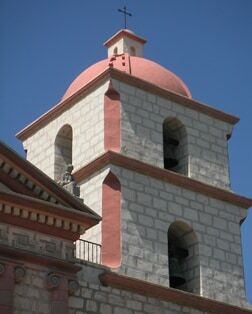 The Old Mission is now a California Historical Landmark and is one of the most popular attractions in the area. Just outside of Santa Barbara, lies the Santa Ynez Valley which is home to numerous world-renowned wineries. The scenic beauty of the dramatic mountains, lush valleys and oak trees is only surpassed by the rich flavors of the wines produced in the area. Founded by Catholic settlers in 1786, the commanding presence and graceful lines of this majestic mission leave no doubt why she is called "Queen of the Missions." Featuring the ideal Mediterranean climate for growing grapes, the fertile Santa Ynez Valley is home to California's most accomplished wineries which have produced award-winning wines since the 1970s. Considered the most beautiful government building in America, this impressive Spanish-Moorish style landmark completed in 1929 occupies a square block in downtown Santa Barbara. The heart of Santa Barbara, this bustling, vibrant district lined with one-of-a-kind boutiques, restaurants and cafes is popular with locals and tourists alike. This quaint Danish-themed town founded in 1911 replicates Copenhagen with its windmills, cobblestone streets, half-timbered walls, thatched roofs and restaurants featuring Danish cuisine. Nestled among the verdant, rolling hills of Santa Barbara's wine country, this charming village-like town is renowned for its art galleries, wine tasting shops and craft boutiques. Pause to take in the grandeur (and a photograph!) of the landmark Moreton Bay Fig Tree, the oldest fig tree in America planted in 1870 and spanning 160 feet. Whale watching is a popular pastime as is horseback or bicycle riding along the beautiful landscape; as well as kayaking or exploring the many eateries, breweries and vineyards located throughout the region.